August 30, 2011 Adri H.
Design Process Series: See the original swatch in the background? Inspiration comes from many different sources. Sometimes, I am inspired by something I see on the street, in a movie, on a magazine cover on the newsstands, or even at the museum within a painting or sculpture. Inspiration can also come from practicality - Me: "Gosh, I really would love a cardigan in xyz color to go with that great top..." Often, I am inspired by the mood boards sent out by magazines and publications; which was the case for Academia, a sweater vest I designed for Twist Collective. For this project, I was inspired specifically by text on one of the mood boards for Twist Collective's Fall 2011 collection. One of the themes mentioned "bookworm" and immediately I thought of sweater vests. But, what of them? What kind of sweater vest? A ribbed one or cabled one? I think those are pretty standard. But, what about something a bit more adventurous to knit? At this point, I have to mention that I had already been working on designing some fair-isle mittens so fair-isle was on my mind. I spent over a week researching and reading about the Fair Isles and the history of the stranded color-work we have come to call fair-isle. So, what popped into my mind was this image of the Duke of Windsor wearing a fair-isle sweater with a dog in his arms. Yes, this was it. 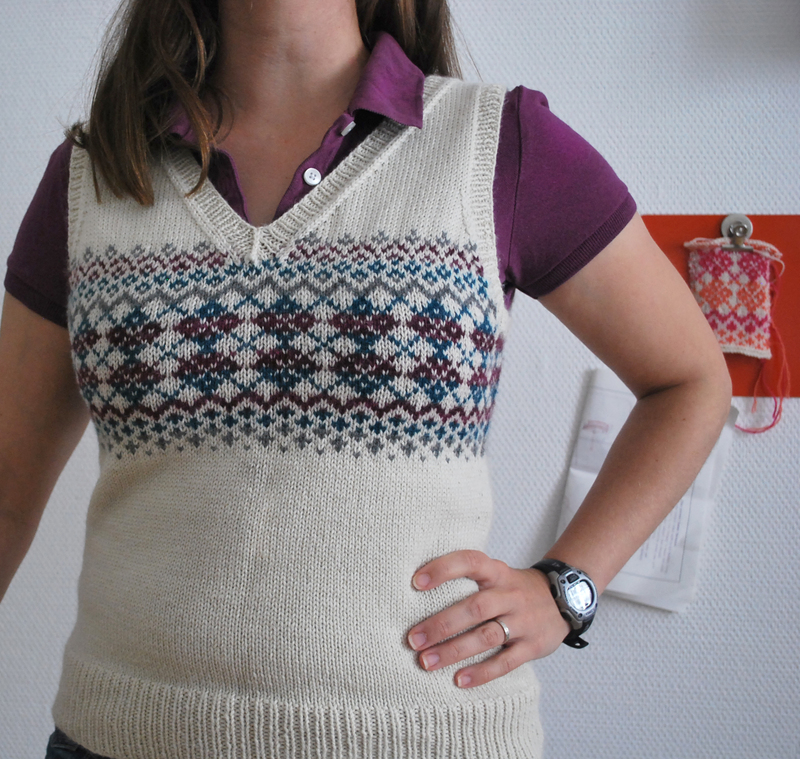 A fair-isle vest it would be. What would the color-work pattern be? Would it be lots of X's & O's like on the Prince's jumper? An all-over fair-isle design? I thought the color scheme in the painting was a bit muted for my taste. I studied the pattern and color choices carefully, but muted colors aren't really my style nor did the pattern itself really appeal to my aesthetics. With those considerations in mind, I combined a series of fair-isle patterns including an argyle segment to create a motif that would be the eye-catcher of the garment. I sketched out the idea, plotted the pattern on a grid with OpenSourceCalc, and then added an illustrated schematic with garment measurements. I then knitted two swatches with yarn I had in my stash. I scanned the swatches, bundled my sketches and illustrations together as a PDF document, and sent it off to the editors of Twist Collective... and then waited.